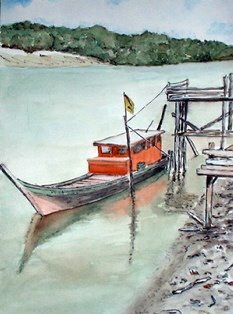 This picture was painted atop a broken fishing jetty along the Sungai Sepang. The scene is at low-tide, and fishermen moor their boats here. At high tide, the water level can sometimes reach the bottom of the floorboards of the jetty and water can be more than 15 feet deep. At the far side is the verdant mangrive forest. In the past, this stretch of waterway was contaminated with pigwaste from farms upstream. After the Japanese Encephalitis scare in the late 90s, the farms have been moved away and the water here is relative clean, much to the delight of weekend anglers. Not far from this jetty is a seafood restaurant. This piece was done in Sept 2004.